– Defy Stain Stripper had no problem with removing the two-year-old TWP stain. It softened the stain to the point that light scrubbing would remove the finish. On the first pass with the stripper, more than 90% of the old stain was removed. Spot treating the rest proved effective for 100% removal. – The Defy Stain Stripper comes premixed and is not to be diluted. We took precautions by wearing protective clothing, gloves, and eyewear. The stripper was applied with a garden pump sprayer, sat for 15 minutes, scrubbed, then high pressure rinsed off. – The cedar wood had retained 90% of its natural color after the Defy Stain Stripper and Defy Wood Brightener. – Excellent deck stain stripper. Defy Stain Stripper would be a solid choice for a residential homeowner who is looking to remove a failed deck stain. Is this product plant safe? I have boxwood around my deck. Should we cover with tarp? Best to cover the plants with a plastic tarp when using a stain stripper. Is this plant safe or should I cover my plants that are around my deck? Best to cover the plants when using a stain stripper. Can I use RAD Brightener after Defy stripper? I already have it. Will this remove paint as well or deck stains only? This and any other deck stain strippers will not remove paint or solid stains effectively. That will require sanding. When I washed the stripper off my redwood deck with the power washer, the grains of the wood were raised up. I followed with the brightener. If the grain s in the wood are still raised when the deck railing dries, should I lightly sand the wood before staining? 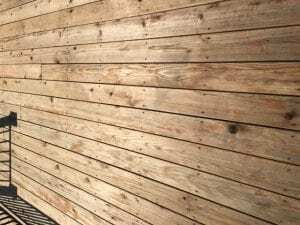 What caused the wood grains to raise and how do I prevent it? Raised grain is normal and sometimes happens when stripping. It is actually better for the stain when applied. It soaks in deeper this way and will have better wearing because of it. Typically sanding is not needed but if you want, sand with 60-80 grit paper, no finer. Thank you, your help, quick response and information has been greatly appreciated! I’ll let you know how the project went when I finish. Thanks for the review on DEFY. The stain stripper and then brightener really did the job. We have a 600 + square foot deck, stained after a new build with Penofin (at the recommendation of a contractor and another knowledgeable person). 2 1/2 years later, the finish was peeling, and needed to be removed. After doing research on this site and others, decided on Defy liquid stain stripper and Defy brightener. It was stripped and cleaned and brightened today, see the photos to see the difference. Stain (with Armstrong) will be done early next week. Just FYI… In the product stats, it says that this product sells for $19.99 per gallon. We had to buy from Amazon, because we could not find it locally anywhere. It is $34.99 per gallon on Amazon. Used a little less than 3 gallons for the deck. Everyone has a deck stain story, and basically all the stories are bad. 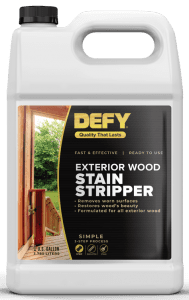 I never do reviews, but Defy Wood Stain Stripper saved our sanity. Our 1700 square ft deck plus benches and stairs was originally stained with a horrible product called Penofin. It turned black and the factory came and stripped it and re-did it working 8 hours a day for a month and unfortunately restrained it with the same lousy product. The deck turned black again. The factory man had quit. The contractor denied responsibility. My wife found Defy on the internet, and ordered a gallon. Defy applied liberally, allowed to set up for around a half hour, and hit with just a narrow torrent of water from the outdoor spigot with a good old-fashioned spray nozzle saved our deck. Sure I had to do a couple of areas twice, but so what. Does this product work on removing Behr Deck over? I just finished stripping a cedar deck using both the Defy stripped and cleaner. I have been a deck owner on several homes over many years I absolutely detest this every 2 to 4 year project. Having used several different products, a friend recommended the Defy product and I have to say that I am absolutely amazed at how well the Defy products worked. 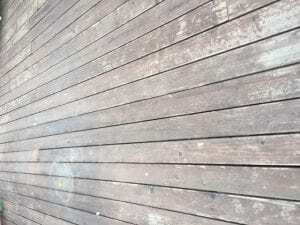 Preparing a deck to be stained is still not an easy task, but I followed the directions and the results were fantastic. I did use a power washer to remove the stripped, but the old stain came off every easily. You have won over a new customer. Thanks for the review Joe. I'm trying to strip a fence. However, since I have to refinish nearly 2000+ sq feet, I 'm having trouble stomaching the cost of this stripper. I tried a cheaper one, but it is taking forever to get all the stain off. I'm applying the remover per the instructions and today it took me about an hour to remove the stain from 300 sq feet using a 3000 PSI pressurer washer. 1. How important is it to remove ALL the old stain. Can I just stain over the really tenacious stuff? I'll be covering my fence with Defy acrylic. The old stuff is Olympic acrylic. 2. If #1 is not a good idea, any suggestions on a more cost effective stain remover? 1. When switching brands it is best to remove all or as much as possible of the old stain. Try for 95% or more. Little here and there and in the knots should be okay. 2. Depends on the type of stain that the Olympic was? Semi-trans? Semi-Solid? Solid stain? The RAD stripper and HD80 are pretty economical. I used Olympic Maximum semi-transparent. As an aside, I hit a portion of my fence where i can't get the stain off at all. Would it be best for me to use the Olympic stripper? Or try the RAD / HD80? I would try the RAD or HD80. They are powders that can be mixed stronger if needed for difficult to remove stains. Make sure that you wear protective clothing, gloves, etc when doing this. I need to remove a solid stain. Was wondering what stripper would work the best to remove the stain? Sanding is the only effective way to remove a solid stain. Deck stain strippers do not work on solid stains. I used the Defy Stain Stripper and have several areas where the stripper was not effective (actually I wasn't effective in scrubbing it completely off). It has been well over 24 hours and I'm not sure whether I should reapply the stripper to the trouble areas or use the Brightener to neutralize the stripper. The deck floor is completely fine, it's mainly on the vertical areas i.e. the spindles on the rail. Do the stripper again until it is all off before brightening. Pressure washing after the stripper is applied will help. This product not as good as it was 5 years ago. The Defy Stain Stripper formula has not changed in the last 5 years. Al, nothing lasts more then 2-3 years on a horizontal deck. The key is to use a penetrating semi-transparent stain that can be applied int he future without a hassle. There is nothing that can go on top of your coatings and \”fix\” the underlying issues. The oil based paint will probably last 2-3 years but no longer. Is it OK to use Restore-A-Deck Injectable Stripper, Defy Brightener, and Defy Extreme Stain or should I use one manufacturer for the whole process? John, very hard to remove a stain that was just applied. It does not matter if you do now or wait, either way it will be difficult unless you wait a couple of years. What stripper can you recommend to strip Behr premium solid deck stain (acrylic), considering that you found the Behr stripper product to be essentially worthless? When dealing with solid stains, no stripper will work very well. Plane to use a powdered stripper like HD80 or Restore A Deck, mix strong, pressure wash to remove much as possible. This could be anywhere from 20-80% in our experience. Sand rest to remove. This is not an easy thing to do.